Bhindi Fry Recipe | How To Make Bhindi Fry (Sukhi Bhindi) | Cook Click N Devour!!! Bhindi fry recipe is a quick preparation of okra with Indian spices. Sukhi means dry and this is a dry okra fry that goes very well with soft phulkas and rice. So easy to make, this punjabi okra curry will be your favorite to prepare on busy weekdays. Serve with some rice, dal fry or soft rotis for a comforting and healthy meal. Here is an easy step by step recipe with video for making bhindi fry. Okra known as bhindi is one of the most used vegetables in Indian cuisine. We have recipes right from delicious masala, curry to gravy to pakora with okra. I usually cook bhindi at least once in a week. Mostly I make vendakkai poriyal to go with sambar but at times I do make besanwali bhindi or this bhindi fry. I make such north Indian sabzi especially when we have dal fry or dal tadka in the menu. For this easy bhindi fry I use very minimum spices and saute till the okra becomes dry and slightly crispy. The finsihed okra fry is so good that you will east it as such as snack 🙂 On that note this sabzi is indeed a great finger food for toddlers and kids. How To Make Bhindi Fry. Bhindi fry recipe can be made in flat 15 minutes once you have chopped okra ready. I prefer to use groundnut oil for this recipe. You can also use mild sesame oil. As mentioned above I like to use minimum seasoning in this recipe so that the flavor of okra shines through. Some garam masla powder is the only spice powder I use apart from chili powder and turmeric powder. This is a no onion garlic bhindi fry recipe. Adding onions lends some moisture to okra and it will not be very dry and crispy as desired. So I prefer not to add onions in this recipe. To make this sukhi bhindi first of all heat oil in a pan, preferably cast iron. Temper with cumin seeds and add chopped okra. Next just add all the seasonings and saute in medium flame. Cook in open pan for 10-12 minutes until the bhindi turns dry and crispy. Finally you can add some lemon juice and mix well. Crispy and delicious bhindi fry. This is such an easy sabzi that you can whip up in minutes even during busy mornings. Perfect side dish to pack in toddlers and kids lunch box. First of all select tender and fresh okra that has no bulged spots or seeds. The tail should snap in a whim. Next gently rinse the okra and pat them dry thoroughly. Use a soft kitchen and wipe out the excess moisture. The knife and cutting board you use should be dry as well to minimize the oka slime. 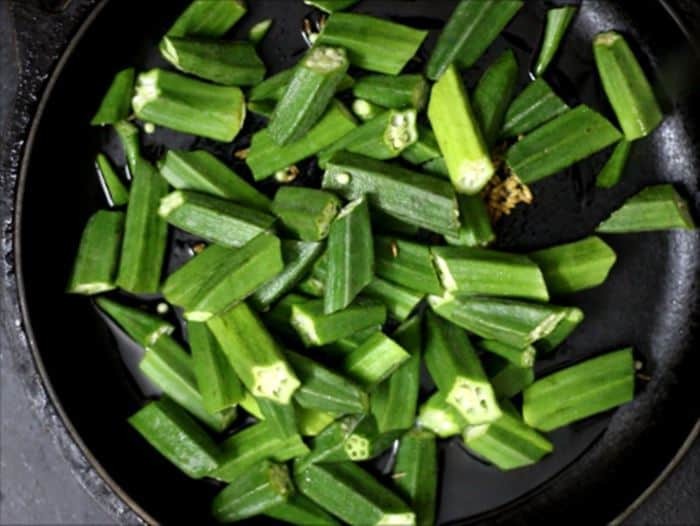 To reduce the okra slime you can also chop then into bigger pieces as seen in the recipe. Next use a heavy pan, preferably cast iron to avoid burning. Also cook in medium flame for uniform cooking. Do not cover the pan while cooking as that will create some moisture and reduce the crispiness in bhindi fry. Finally keep sauteing frequently and you can cook for few more minutes to make the bhindi more crispy. Serve this sukhi bhindi with dal, dhaba dal, samabar or rasam for wholesome hearty meal. This also goes very wwell with phulka. How To Make Bhindi Fry Recipe Step by Step. 1. Gently rinse the bhindi (okra) in water and pat them dry thoroughly. Slice and remove the crown and tail of the bhindi. Chop them into big pieces. Set aside. 2. Heat 2 tablespoons oil in a pan. temper with cumin seeds. 3. Add the chopped bhindi and saute well for 2 minutes. 4. Now add salt and mix well. 5. Next add garam masala powder. 6. Add chili powder and turmeric powder. Mix and saute in medium flame for 3-4 minutes. 7. Continue to cook for 10-12 minutes in open pan until the bhindi is dry and crispy. Serve hot with rice or roti. Punjabi Bhindi fry is a delicious, crispy and dry okra fry that you can make in 15 minutes. Best served with rice, dal or roti. Gently rinse the bhindi (okra) in water and pat them dry thoroughly. Slice and remove the crown and tail of the bhindi. Chop them into big pieces. Set aside. Heat 2 tablespoons oil in a pan. temper with cumin seeds. Add the chopped bhindi and saute well for 2 minutes. Add chili powder and turmeric powder. Mix and saute in medium flame for 3-4 minutes. Continue to cook for 10-12 minutes in open pan until the bhindi is dry and crispy. Serve hot with rice or roti. Love this simple okra fry. Can I add onions in this? Thank you Cinnu. Yes you can add onions in this recipe but the fry will turn a bit mushy. If you want crispy bhindi fry leave out onions.